Enjoy our Signature Cocktail for just $5 ALL DAY every Sunday! 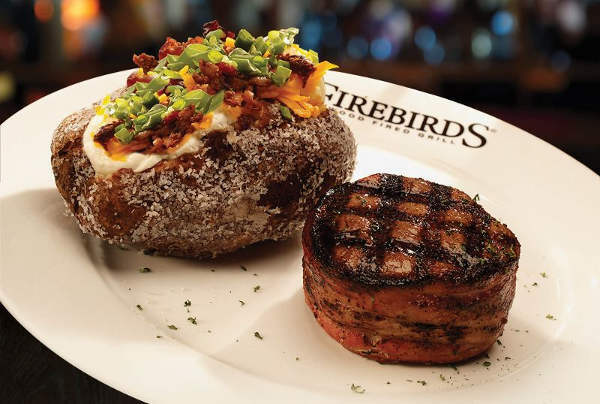 Firebirds Wood Fired Grill is located in Overland Park on the south side of Metcalf in the Corbin Park area. We are an American Restaurant and Steakhouse known for our scratch kitchen, bold flavors and inviting atmosphere. Enjoy our signature menu items including hand-cut, aged steaks and fresh seafood or our specialty crafted cocktails and select wines. Join us for Happy Hour Monday-Friday 4PM-6:30PM at the FIREBAR ® or on the patio for drink specials and bar bites. We offer top-notch service and upscale dining at a modest price. Located East of 69 highway on the south side of Metcalf in the Corbin Park Area. We are just East of Von Maur and adjacent to the new Scheels.